If you like Elegant Grunge, please consider buying one of my products. Version 1.1 has been updated to the WordPress.com version. This version no longer contains automatic image framing, or a photoblog template, so if you wish to continue using these features, please use version 1.0.3. Note: If you have problems with this theme, please post your question at the WordPress forums. Please don’t contact me directly, as I don’t have the resources to help you. To use these language packs, you must download the WordPress language pack first, copy it into wp-content/languages, then edit wp-config.php and set the WPLANG value to the appropriate language abbreviation (eg ‘fr_FR’). Then unzip the Elegant Grunge language pack into the wp-content/themes/elegant-grunge folder, and you’re set. Paul Kaiser has written a great article on how to add navigation menus to older WordPress themes, using Elegant Grunge as an example. PHP, Web, WordPress, WordPress Themes. Bookmark the permalink. Both comments and trackbacks are currently closed. Michael, Hope your doing alright in Aussie land. Was wondering if you knew how one could add a simple dashed line between sidebar widget items such as “recent posts” so that each post listed has a dashed line between on your theme. Thanks for any insight. Thanks, Martin – I’ll update the link here. Michael, your theme is amazing. I’ve been using it for my blog, mostly untouched. It is great seeing you further developing and fixing it. Keep up the great work! thank you, this is perfect for my travel blog. Isn’t a missing in the Links page template ? I wanted to say : isn’t a div id=”body” missing in the Links page template ? It&apos;s Trevor,another user of your elegant theme.No seriously it is elegant! :P Alright,I&apos;m having a few problems here.If you check out my site,only two images show up under the photoblog &apos;feature&apos;.However,even though I have another post with the tag,it doesn&apos;t show up in the sidebar.Why is this? Michael….I&apos;ve kinda fixed the problem,but I can&apos;t understand why the photoblog feature takes only one and the first image from the post with the tag. In one of my posts,I have around 5 images in which photoblog reads only the first image. Could you please help me in this regard. Hi michael! I&apos;m installing your theme in a wordpress, but I&apos;m having a trouble. I cannot understand what&apos;s that black line under the top header… I&apos;m getting mad and cannot solve! <a href="http://www.rollingwatermelon.net/migrazione/">check here and help me please!</a> i didnt change any css code ….. :( thank you! Forgive me for the newb question. But with this theme that I have installed, I see the option for a ‘custom sidebar’… does that mean I can have a custom sidebar on certain pages, or just one global custom sidebar using widgets or something like that? Thanks man for putting out an Awesome theme. Can I just replace 1.1 version style.css file with the 1.0.3 one I’ve edited, or is it completely different? I haven’t actually tested the theme under 3.1.2, and haven’t verified Xiao’s findings – I’m not actively supporting the theme at the moment due to other commitments. If would suggest trying it in a non-live environment, and if it doesn’t work properly, grab version 1.1 (..which won’t appear as an update as the WordPress folks rejected the submission, which is strange as I submitted exactly what they sent to me after adapting the theme for WordPress.com! I haven’t the time to address their comments, so it’ll have to remain here only, for the time being). I’ve looked through all the available themes and yours was by far my favourite. Only problem for me is that photos come out so small. Is there any way to make them bigger, expand them to the width that youtube videos can get? Hi, I am trying to post an mp3 to Elegant Grunge blog. Is there anyway to do it? Thanks! This is perfect for my personal blog! thanks for sahring.. Thank you for your wonderful template available on WordPress. I love it. Am I making some blunder or is it an issue with the current versions? 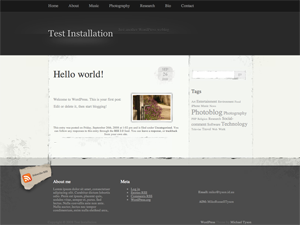 I am using wordpress 3.2.1 and tried to use elegant grunge 1.0.3. I would love to use this theme instead of the default one! Hey Luis – I’m afraid I’m not sure, off the top of my head. Try posting the question on the WP forums – I’m sure someone there will know. Sure. Let’s see what they guys there have to say! Hi is there a way to add a link to the header that points to another webpage (but is not a page in the current blog)? I want the link to have the same formatting as the other menu items that point to pages. Thanks for lending out Elephant Crunch for a while. Thanks for supporting a disabled satirist. Is there automatic and legitimate copyright for the content on the site? I am using your theme for my wordpress.. wondering how I can customize the comment area? It seems everything from “Leave a Reply” down is set in stone and I don’t mind that, only when users go to share my post on fb (via sharethis) the share is pulling “You may use these HTML tags in your comment, etc.” I need to get rid of that it looks so bad, but I cannot customize comments area.. any help from you would be great thanks! Hello I Just installed you theme, Wow! Elegant indeed! however, I am having an issue with loading a picture that fits correctly into the header area. I have uploaded multiple files to my media section and try linking it to the header section but the scale and framing of it is not correct. I would like to know how many pixels the photo should be in order to fit properly. I am not too fluent with code but am willing to dive in and try to figure out how to customize/ adapt to the header image specifications. Awesome theme! Very clean, functional and well coded. I feel extremely stupid but I cannot find the ‘editor’ under themes, so I cannot find the functions.php. I love Elegant Grunge but I really don’t know what to do. Copyright © 2008-2009 A Tasty Pixel. Contact Us | Newsletter | Follow us on Twitter!